To the untrained eye, they appear to be simple daubs that could have been created by a two year old. Which is precisely what they are. But that didn't stop the supposed experts falling over themselves to acclaim them. 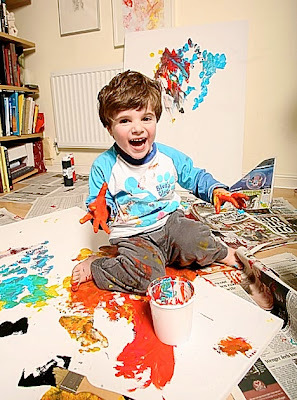 The toddler in question is Freddie Linsky, who has fooled the art world into buying and asking to exhibit his paintings. Freddie's efforts, which include works using tomato ketchup composed while sitting on his high chair, were posted by his mother Estelle Lovatt on collector Charles Saatchi's online gallery. ..."He has progressed from ketchup to acrylics on paper or canvas. I wondered whether the art world would be encouraging or dismissive if I showed his work online. That's what modern art looks like to me - the finger paintings of a two year old - turns out I was right!